With exceptional generosity, the Musée Marmottan Monet is loaning Claude Monet's famous picture Impression: Sunrise, after which the Impressionist movement was named, to MuMa for four weeks. Painted from the Grand Quai overlooking Le Havre harbour in 1872, after 145 years, Monet's masterpiece is returning to its birthplace to be displayed, for the first time in its history, against the backdrop of the scene that inspired it. Impression: Sunrise is the centrepiece of an exhibition entitled "Impression(s): Sun" featuring around 30 works by five major artists from the nineteenth century and the early twentieth century: J. M. W. Turner, Gustave Le Gray, Eugène Boudin, Félix Vallotton and Raoul Dufy. 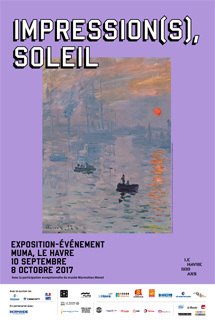 All of them spent time in Le Havre, some before and some after Monet, and were fascinated by its scenery and its light. To highlight lines of descent, different visions of the same subject, and the ways in which the artists influenced each other and to show how widely artistic interpretations of the same subject can vary according to style and period, the exhibition focuses on depictions of the fleeting moment when the sun rises or sets. As Le Havre celebrates the 500th anniversary of the founding, this exhibition reminds us that the city and its harbour have inspired numerous artists and prompted them to embark on artistic experiments and innovations. With great generosity, the Musée Marmottan Monet has allowed Impression: Sunrise to return for the first time in its history to the city where Claude Monet painted it in 1872. Described as a “universal work” and as “an absolute masterpiece”, this view of Le Havre harbour in the early morning, with the rising sun emerging from the mist, accidentally gave its name to the artistic movement known as Impressionism. It was purchased in 1874, when it was one of the works shown in the first Impressionist exhibition, but subsequently fell into oblivion. It was only belatedly and gradually that it acquired its reputation as a masterpiece. The picture’s return not just to Le Havre, but to a location not far from the spot on the Grand Quai (now the Quai de Southampton) where Monet painted it from a hotel room 145 years ago, offers a unique opportunity to contemplate the work with its subject. Seeing them in close proximity enables us to conjure up the emotion experienced by the artist, feeling what Monet felt as he gazed in absorption at the sight of the sun coming up, to reflect on what makes this picture so uniquely poetic and how the artist achieved this effect, and to revisit the subject and perhaps see the industrial setting of Le Havre harbour with new eyes. But Monet is not the only artist who endeavoured to capture the light of Le Havre. Impression: Sunrise is the centrepiece of the exhibition “Impression(s): Sun”, which features around 30 works by five major artists from the nineteenth century and the early twentieth century: J.M.W. Turner, Gustave Le Gray, Eugène Boudin, Félix Vallotton and Raoul Dufy. They all spent time in Le Havre, some before and some after Monet, and were intrigued by its bustling harbour setting, the changes it was going through and its differing lights. Looking east, towards the rising sun, Le Havre was a busy, thriving modern harbour. Looking west, towards the setting sun, the long curving beach allowed one to lose one's gaze in the contemplation of endless sea and sky. Le Havre also meant the peculiar light of the Seine estuary - ethereal, shifting, flaring up into sublime rages, flaming with sumptuous colour or clear and pale. In the nineteenth century, Le Havre offered a wealth of subjects to artists in search of new subjects and the modernity Baudelaire defined as “the transitory, the fleeting, the contingent”. By focusing on depictions of sunrise and sunset, which are always transient but never the same twice, “Impression(s): Sun” highlights lines of descent, different interpretations of the same subject and ways in which the artists influenced each other. It explores the creative process itself, reflecting on how artists can capture something as intrinsically fleeting as the moment when night becomes day or day night, how they go about conveying an impression, and what processes they harness in order to do so. Each of the six artists provides a different answer. Like Boudin’s, Monet’s method for capturing the moment evolved in the course of his career. Fast painting was not always his solution to the challenge of depicting a changing subject: in fact, he suggests an astonishing range of artistic approaches. The exhibition also highlights the way Le Havre, the setting for these aesthetic explorations, is treated differently by different artists. For some, it is a real place whose elements can be named; for others, it is reconstituted from memory or deliberately recomposed; a third group of artists reduce it to an abstraction - a line of horizon between sea and sky. What, ultimately, is the subject of the works in this exhibition? A city? A harbour? An activity? The sun? Light? Something of all of them, perhaps, with each work representing a different response to the selection. The exhibition was made possible with the special support of the Musée Marmottan Monet. From September 10 to October 8 included (except Mondays), the MuMa will be exceptionally open from 7:30 am to 8:30 pm for the exhibition Impression (s), soleil! From May 27 through November 5 2017, A Summer in Le Havre invites curious parties to discover the city and its famed port through a series ofrich, festive, multidisciplinary programming.In keeping with their vision for public spaces, Jean Blaise and the associate curators have invited artists to practice and explore their own creativity, in order to reveal the beauty of Le Havre’s city and port. Relying on the great riches of the city, as well as its savoir-fair and talents, A Summer in Le Havre 2017 will outline a new relationship to the city, embodying a veritable culturalrevolution in progress.